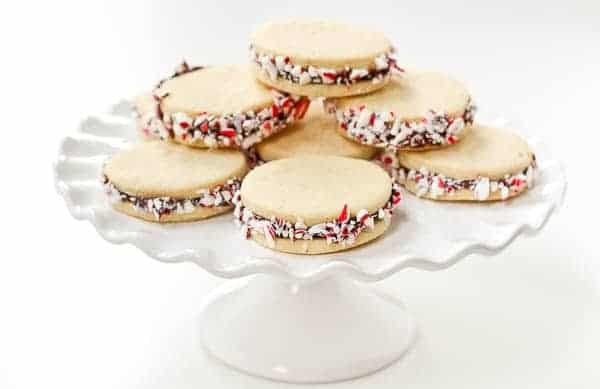 These Peppermint Sugar Cookie Sandwiches with Chocolate Ganache are easy to make and a gorgeous addition to your holiday cookies. Well, Thanksgiving is over. You know what that means!!! COOKIES. But first, let’s talk about Thanksgiving. I hosted for the first year ever, but before you go and get impressed, I was only hosting Ben’s parents and my parents. I love to cook with my mom, so we had fun cooking together and trying new recipes. I prepped a lot ahead, but we tackled a few things the day of. And of course, everyone contributed. My mother-in-law brought cheesy potatoes and a pumpkin roll. (PS: A cake roll of some sort is officially on my baking bucket list.) Oh and she brought a Honeybaked Ham. THE BEST. My mom brought two pies and the turkey. I made my Brussels sprouts salad with the best Pecorino Romano I think I’ve ever tasted. I also made slow cooker stuffing (so moist and perfect! ), cinnamon apple cranberry sauce, green beans, braised parsnips, and baked sweet potatoes with cinnamon-honey butter. As for the turkey – ooooh boy was it good. My mom and I cut it apart into pieces which was somewhat of an adventure. We were both going at it with knives – it’s a miracle no one lost a finger. We adapted a recipe out of Cooking Light magazine – a brown sugar and spice rubbed turkey with apple bourbon gravy. It was so good and I’m 100% going to recreate it again sometime soon with chicken. But NOW we’re on to cookies. On Saturday, we made cutout sugar cookies for the kids to decorate. They had an absolute blast. 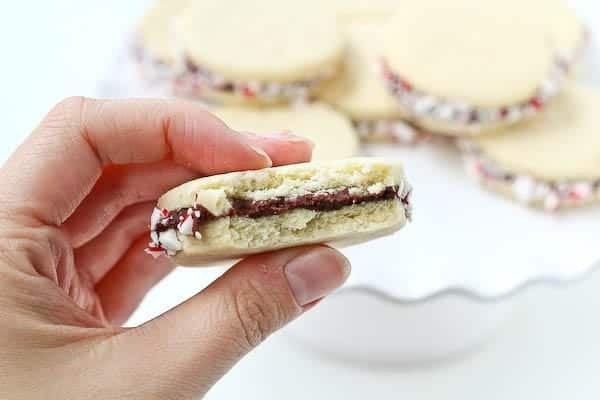 These cookies are a fancier version of the classic sugar cookie. 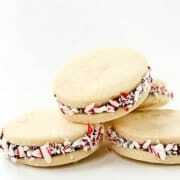 Delicate peppermint sugar cookies sandwich rich, dark, flavorful ganache. 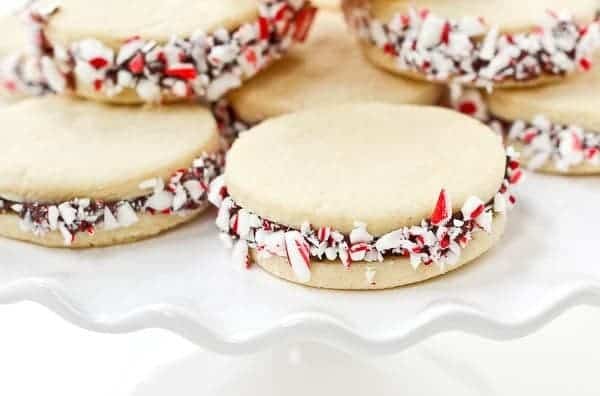 The crushed candy canes on the edges make these so fun and fancy – perfect for any holiday party or Christmas cookie tray. What’s going to be on your cookie tray this year? 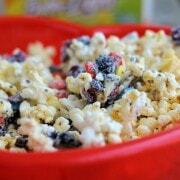 In the bowl of your mixer cream butter and sugar until light in color and well incorporated. Beat in mint extract and egg until combined, scraping down sides as needed. Meanwhile, combine flour, baking powder and salt. Once egg and mint extract are mixed in, slowly add in flour mixture. If your mixer gets mad because the dough is too thick, you can finish it by hand (knead the dough together). In small batches, roll out dough on a floured surface to about 1/4-inch thickness and cut into circles – I used a biscuit cutter. Bake at 350 for 6-8 minutes. Let cool on the cookie sheet until firm enough to transfer to a cooling rack. Cool completely. To make ganache, heat cream in a small saucepan over medium heat until just starting to bubble, but not boiling. Meanwhile, place chocolate chips and butter in a bowl. Pour hot cream over the chocolate and butter. Let sit for 5 minutes undisturbed and then stir until all the chocolate is melted. Let cool until the mixture is thickened enough to be spreadable. Once ganache is spreadable, spread it onto one of the sugar cookies, all the way to the edge. Place another cookie on top, pressing down lightly. Roll the edges in candy cane to decorate. Continue this process until all the cookies have been filled and made into sandwiches. Verdict: I love these pretty little things!! Husband’s take: No complaints from the peanut gallery. Changes I would make: None! 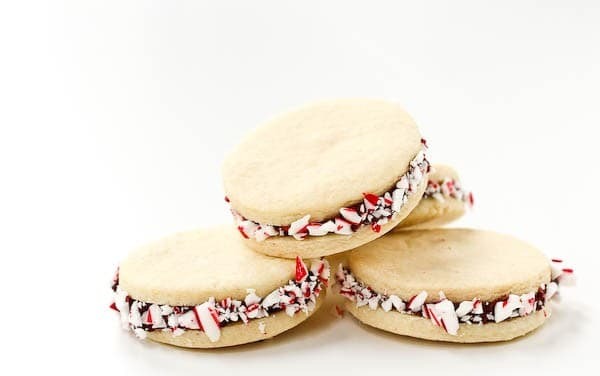 But feel free to roll them in sprinkles if you’re not a candy cane fan. Difficulty: Moderate. 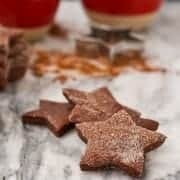 The cookies can be a bit fragile – just make sure your ganache is cooled off and thickened, but not too thick. Then, carefully but quickly spread it onto the cookies. Or make sure to check out and follow my All Things Christmas board on Pinterest for lots of great ideas throughout the next month! I’m so excited cookie season is upon us! These look delightful! 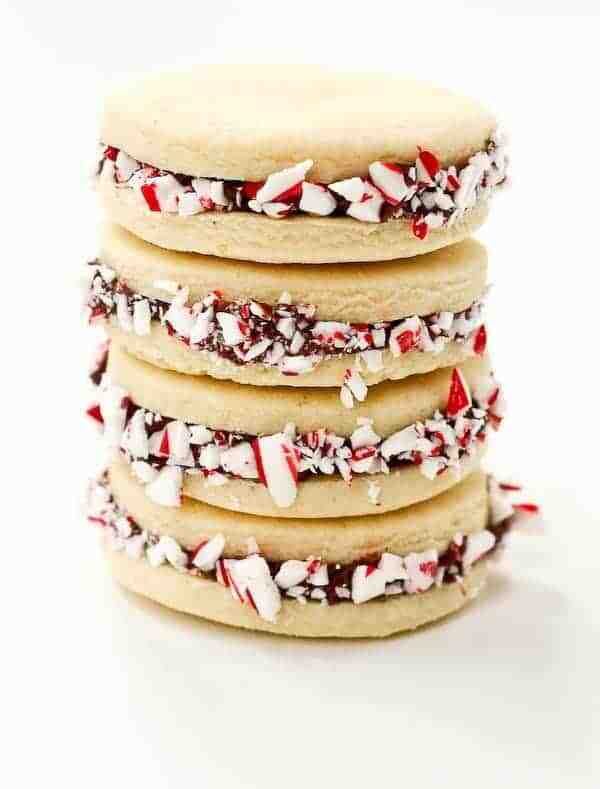 These are definitely going on my cookie plate this year. They look so so good!! 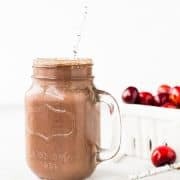 These looks sooo good. I’m a sucker for a little chocolate with my peppermint candy canes. Omg yes please! These are so festive and pretty, and sound absolutely divine! Adding to my ever-growing list of must-try cookies in the next few weeks. I love them, so attractive, and tasty, Great for entertaining!